Casa Maria supports all people having a place to sleep at night. 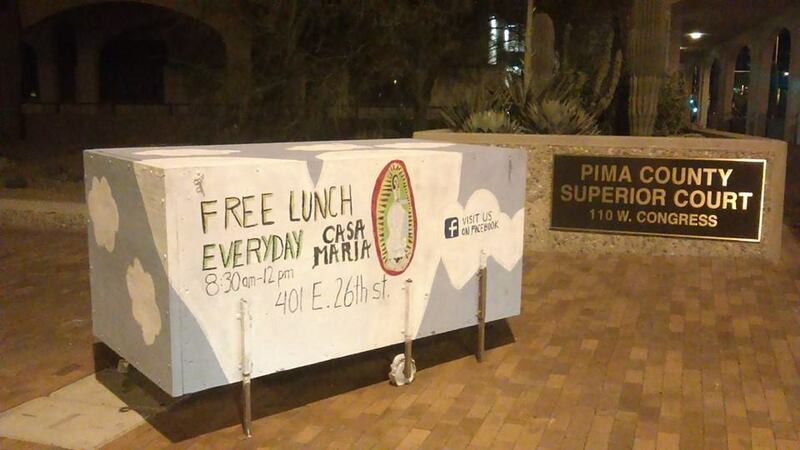 Casa Maria supports SAFEPARK which is located downtown in Pancho Villa Park. John McLane is a founder of SAFEPARK and a friend of Casa Maria. Three years ago, a group of ‘homeless activists’ with the group Occupy Public Land​ set out to decriminalize homelessness in the City of Tucson and during that effort fill in the gaps in services for both the houseless population and those wishing to express their rights and redress their grievances. The basic needs that we have seen are not only necessary for survival, but necessary to ensure people have the ability to pursue happiness as they see fit. We have thankfully been able to provide shelter to over 30 people so far in a #DreamPod, a place for people to bring material donations, and a safe place to exist without fear of harassment. The key gaps that we have distinguished in 3 years of research are; 1. There are no couples or pet shelters in the city. 2. Minimal amount of shelter beds, and extraordinary restrictions. 3. No Public 24 hour bathrooms. 4. No 24 hour location to protest in the City. 5. Finding food can be an all day job, and too few options. 6. Services are spread out around the city, and many have trouble getting to them. 7. Lack of community connection between the houseless population and housed. In launching our #PeoplesParkway program we aspire to address each of these gaps one by one, and at one central location in the heart of the City of Tucson. Our current residents of #SafePark take shifts in monitoring the area as well as cleaning up the park and surrounding area. As we further develop the program and area we will as well host a welcome tent with literature and an activity board, donation center, homeless services resource center, arts and crafts workshop and canopy, and dozens of other programs to keep people engaged and on the track to learning skills, and creating a job for themselves. thee post. I’ll certainly comeback.